The Mustang was redesigned for 2015, featuring an independent suspension to replace the live axle in the rear end, and introducing a turbocharged four-cylinder in addition to the V6 and V8 engines. Actually, it was a return of the four-cylinder turbo, but since the original was decades ago and ahead of its time, and not particularly successful except as a pioneer, it almost doesn't count. Like it did 50 years ago, the Mustang comes as a Fastback coupe, convertible, and high-performance Shelby 350GT. It's still a 2+2 at heart, although now it's nearly as big as a midsize Ford Fusion, at 188.3 inches long on a 107.1-inch wheelbase. That gives it far more interior room than its arch-rival the Chevrolet Camaro. That said, calling it a 2+2 might be generous, as only two small people can fit in the rear. The 2017 Mustang offers a choice of four engines. The EcoBoost 2.3-liter four-cylinder uses a twin-scroll turbo and direct injection, to make an entertaining 310 horsepower and 320 pound-feet of torque. That's more than the V8 of not long ago. Mustang Eco models come with this engine. Even though the 3.7-liter V6 makes a solid 300 horsepower, it's not treated with any fanfare by Ford. They mostly send it to rental-car fleets, and sell it to buyers who care more about Mustang coolness than performance. We'd call the engine's image long-suffering. The 5.0-liter V8 has 435 horsepower and 400 pound-feet of torque, more than expected from a 5.0-liter. It's a great engine. The Mustang GT can shoot to 60 miles per hour in 4.5 seconds and reach 155 miles per hour. The Mustang GT is what the Mustang is all about and it's the one to buy. Unless, of course, you opt for the Shelby GT350, with a 5.2-liter V8 that runs in rarified air. The four-cylinder EcoBoost gets the best mileage with an EPA-rated 21/30 mpg City/Highway, or 24 miles per gallon Combined, with a manual transmission. The convertible and automatic get 1 mpg less on the EPA Combined city and highway rating. The V6 gets 18/27/21 mpg City/Highway/Combined with either the automatic or manual. The V8 rates 15/25/18 mpg with either transmission. The Shelby GT350 scores 14/21/16 mpg. 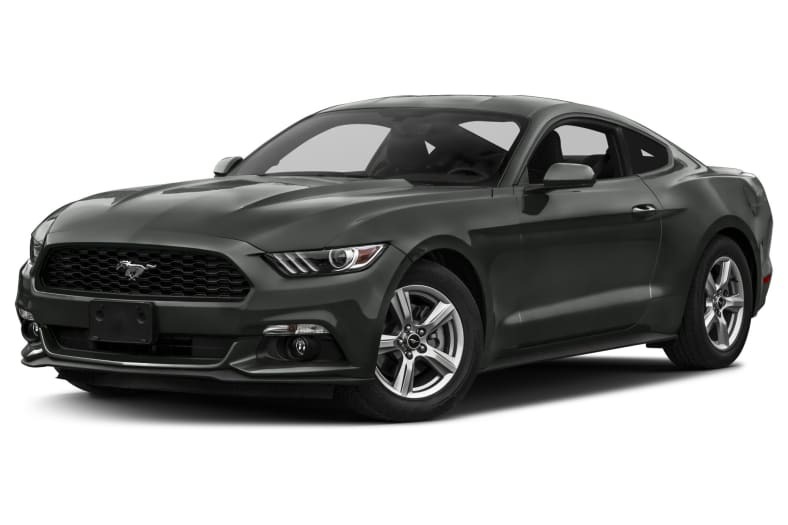 The Mustang coupe earns five stars across the board in crash testing by the NHTSA, and mostly the top Good ratings from the IIHS, but only Acceptable in the difficult small-overlap test that simulates hitting a pole on a front corner.